In 2005, Zagat’s "U.S. Family Travel Guide" called The Magic House museum in St. Louis the country's best attraction for children. Yep, even Disney’s Magic Kingdom took a backseat to The Magic House. Founded in 1979, this interactive children’s museum provides fun hands-on learning activities that encourage creativity. The museum staff loves to help children understand science, history, and the world around them through exhibits that involve them in the action. Located in a renovated Victorian mansion, the museum invites kids to role play, conduct experiments, and get physical on the hopscotch courts in the outdoor play garden. In 2008, a 25,000 square foot expansion with even more exhibits opened. 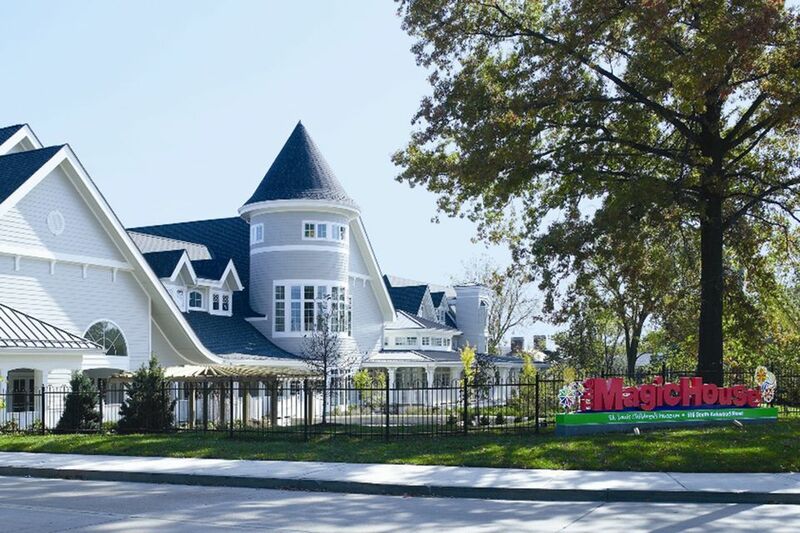 The Magic House welcomes 400,000 visitors a year, making it one of the nation's most popular children’s museums. Everyone from grandparents on down can have fun at The Magic House, but the exhibits are mostly designed for younger children. The “For Baby & Me” area features a peek-a-boo barn, baby gym, and miniature school bus. Toddlers can spend their time at “A Little Bit of Magic,” a fun exhibit that includes a textured tunnel to crawl through, a sandbox for digging, and a mirror maze. There are also dozens of activities for elementary school-aged children, such as the kid-sized community with a bank, grocery store, library, and fishing pond. Tweens enjoy the recurring exhibit called "Kirkwood Safety Town," which frequently opens in the weeks around back-to-school time in the fall. In this mock neighborhood, kids learn about fire, water, and traffic safety, and they can even get fitted for a bike helmet. Older kids also enjoy the chance to star in a television newscast and have fun with an electrically charged ball you can touch to make your hair stand on end. At the "Make-It Workshop," they can see how a 3D printer works or build a sculpture from recycled materials. If dozens of exhibits aren’t enough, The Magic House also hosts special events throughout the year. There's the "Not So Haunted House" in October, "Breakfast with Santa" in December, and "Free Family Nights" when two adults and up to four children can visit the museum on the third Friday of every month from 5:30 to 9 p.m. at no charge (space available). You can also celebrate your child's birthday at The Magic House. There are several different party packages to choose from to make your child's special day a truly memorable event. As one of the more popular attractions in St. Louis, The Magic House can be busy no matter when you go. But with a few pointers, you can maximize your time at the museum. Plan several hours to fully explore the museum. Visit with a 1:1 ratio of adults to younger children, if possible. Time your visit to the least crowded times, typically later afternoons or right at opening on Saturday. Check for special preschool hours during the school year, when you can visit with younger children before the museum opens to the general public. The museum's Picnic Basket Cafe serves salads, sandwiches, and healthy snacks. You can also pack food to eat at the outdoor pavilion on a first-come basis. The Magic House is located at 516 South Kirkwood Road, 1 mile north of 1-44 in Kirkwood. Admission costs $11 for children ages 1 and up. The museum waives the fee for active duty military members and their immediate families and for foster families. The museum is open during the school year on Tuesday through Thursday from 12 p.m. to 5:30 p.m.; on Friday from 12 p.m. to 9 p.m.; on Saturday from 9:30 a.m. to 5:30 p.m.; and on Sunday from 11 a.m. to 5:30 p.m.
Summer hours are Monday through Saturday from 9:30 a.m. to 5:30 p.m., except on Friday when the museum remains open until 9 p.m.; and on Sunday from 11 a.m. to 5:30 p.m.
For more information, call (314) 822-8900 or visit The Magic House's website.